Etherape is graphical network traffic browser. 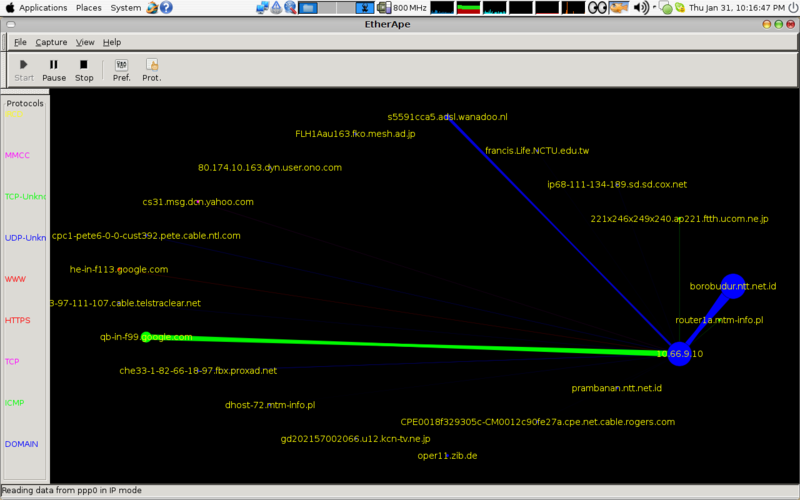 It uses gnome library for displaying graphical network activity. Node and link color shows the most used protocol. The more busy a node is, the bigger its representation. For packet capture and filtering, it uses libpcap. The etherape webpage is at http://etherape.sourceforge.net/. Etherape only can see the traffic physically passing on the net card. The display will be different if you use a Switched network and if you use a Hub network in the same network. If you use a Switch network, you will only see every packet data that go in and go out through your net card. If you use a Hub network, you will see every packets data that are transmitted to every net card. After unpacking 950kB of additional disk space will be used. Selecting previously deselected package etherape. Sing is almost the same like ‘ping‘. It’s a tool to send ICMP packets. The different is ‘sing’ can customize the sent packets with adding certain enhancements (Fragmentation, spoofing….). Sing stands for ‘Send ICMP Nasty Garbage‘. There is no documentation available for ‘sing’ at the moment. It’s made by Alfredo Andres (aandres@s21sec.com) using C.
License under GNU General Public License. Need to get 68.3kB of archives. Selecting previously deselected package libnet0. Selecting previously deselected package sing. Try ‘SING -h’ to display the help.